Chumby, what the heck is that? I received a Chumby for Christmas, a Classic model to be precise rather than the recently launched ONE but more of that later. The Chumby is a difficult device to pidgeon hole. It’s a small Linux powered web connected gadget to which you can add up to a 100 ‘widgets’ from a list of thousands available at Chumby’s website. It is also a streaming web radio and clock/alarm. 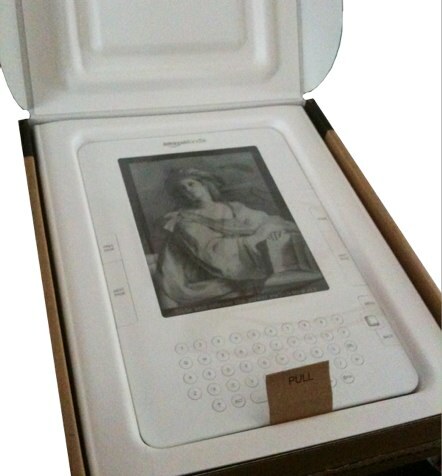 It has a 3.5″ colour touch screen, stereo speakers, two USB “A” ports and a unique soft leather shell. True to their promise, Amazon and UPS tuned up at my front door this morning with a Kindle International, the new, albeit somewhat kludged (more of that later) version of their previous US only EBook. I had lusted after one of these for a long time so when the announcement came that the International version was being released and could be pre-ordered I put my name down that very day. Later, having read some of the restrictions of the International Kindle such as no web browser, no access to blogs, no images in newspapers or magazines etc I cancelled my order. At least I thought I had until the email announcing dispatch arrived. Ooops …. And so here I am with a Kindle International. And first impressions are very good. 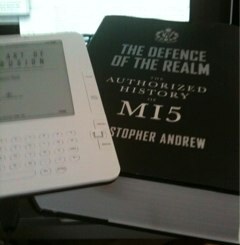 It’s smaller and lighter than I had imagined, about the size of a paperback in width and height and 6mm thick. It is very light in the hand and comfortable to hold, much better than struggling to keep the cover of a thick paperback open or supporting a weighty hardback. The time has come for us to choose a new family car. Our current Mercedes Cabriolet which we’ve had for 5 years is proving very thirsty as it’s primarily used for school runs and short trips into town. Being a 3.2 litre V6 Auto this is the worst possible driving cycle and we’re now seeing MPG figures in the late teens and if lucky, early 20’s which makes it very expensive and gives us about 270 miles from a full tank. Last year we were a two car family. But my Discovery, being rather impractical, was being used less and less. Though I loved that car, it’s 4-litre V8 Auto would struggle to pass 16MPG even if driven very carefully. This was mainly due to the kit that it had fitted, it was an ex-G4 Challenge competitor vehicle complete with full rack, snorkel, front winch and under body armour which all weighed it down. As a journalist working in the technology arena it’s expected that I will have more than my fair share of gadgets. Some bought, some loaned and some gifted to me by companies in exchange for a review (but note I ALWAYS speak my mind regardless). Photography is both an interest of mine and an technology that I use a lot in my day to day work. I don’t have access to the resources of large art department and staff photographers so I need to take photos that are at least half decent to accompany my reviews. Most companies will supply stock artwork for their products but for a review nothing is worse than stock photos. It’s a clear sign of re-hashed PR where the author may have barely used a device let alone formed an opinion of it! And so I have a large collection of cameras, Pro SLR, pocket digital, combo digital and video not to mention the cameras stuffed into the various phones I have in my possession. Video is a new area. The addition of short videos to demonstrate a product are a great value add to a written review. An early investment in a Sony ProHD Camcorder has proved a poor choice, it’s complex to use, the use of tape makes importing of film arduous and the results are far too high quality for most of my web-based needs. And so I have come to buy a Flip Mino HD camcorder. Basic in the extreme but superb in their execution, the Flip series have proved a huge hit selling in their millions. Why? Because as a famous photographer once said, “the best camera you can have is the one that’s with you”! It’s pointless having a £3000 ProHD Camcorder if it’s too bulky to carry. The Flip Mino HD is inexpensive at £129 AND fits in your pocket. RouteBuddy and Ordnance Survey have released 1:50k maps compatible with RouteBuddy’s iPhone Atlas Application. These 1:50k maps join the 1:25k Explorer map tiles already available in RouteBuddy’s Online Map Store.